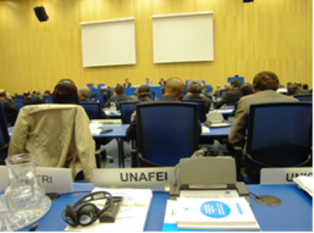 At the 19th United Nations Commission on Crime Prevention and Criminal Justice, UNAFEI's director delivered a statement on UNAFEI's activities in recent years. The following are the main contents of the speech, and the original draft is contained in the separately-attached document. (1) When setting the themes for its international training courses and seminars, UNAFEI has paid careful attention to the measures and policies in the field of crime prevention and criminal justice on which the United Nations places an emphasis, and has actively taken them up. 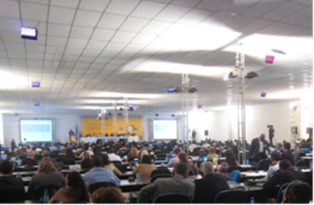 As a result, most of this Congress's main issues and workshop themes have been covered by UNAFEI training courses and seminars in recent years. Thus, UNAFEI has made great contributions to the dissemination and promotion of the United Nations' criminal justice policies to countries throughout the world. (2) UNAFEI furthermore planned and managed a workshop on the theme of “Strategies and Best Practices against Overcrowding in Correctional Facilities E which is one of the topics which the United Nations is currently emphasizing, in this Congress. 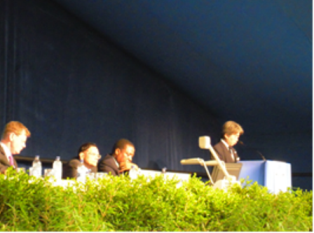 UNAFEI invited world leaders in the field to participate as presenters or panellists. The workshop introduced comprehensive and integrated approaches to discussing not only how inmates in prisons should be treated, but also how such an issue should be resolved throughout all stages of the criminal justice process. As a result, UNAFEI has succeeded in adopting well-developed recommendations. It is our pleasure that this workshop could thus establish an important stage for helping parties settle an important, urgent issue in the criminal justice field around the world. (3) Under close affiliation with the United Nations, UNAFEI will continue working with sister institutions to make efforts to further improve the United Nations' Crime Prevention and Criminal Justice Programme. Details of this meeting will also be posted separately on this website for your reference. For the 12th United Nations Congress on Crime Prevention and Criminal Justice, UNAFEI organized a workshop on the theme of Strategies and Best Practices against Overcrowding in Correctional Facilities. This workshop received acclaim for its highly-concentrated contents and usefulness of proposed countermeasures from many of the attending delegations. Details of this workshop will be posted separately on this website for your reference. 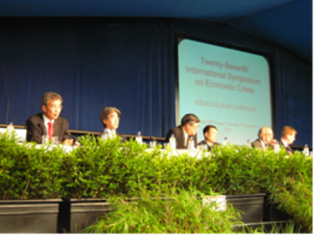 At the 27th Cambridge International Symposium on Economic Crime, UNAFEI's director delivered a keynote address. This symposium is held annually at Jesus College, University of Cambridge under the initiative of Professor Barry A. K. Rider (Jesus College, University of Cambridge). It deals with the important issues of the times and regularly attracts over 900 researcher and practitioners with expertise in economic crime from over 80 countries. This year's main theme was “internal threats to the stability and integrity of financial institutions. (2) Response to these threats in the Criminal Justice field, both in Japan and abroad. The original draft is contained in the separately-attached document. The International Corrections and Prisons Association Annual General Meeting and Conference is an international meeting of experts in the field of corrections and rehabilitation from the private sector, academia, and government. The 14th meeting was held in Mexico. At the meeting, under the theme of “Different Paths, One Vision E the participants exchanged opinions about the latest efforts in innovation in interventions, correctional-management and staff training, technology used in corrections, mental health of offenders, etc. UNAFEI Professor Yoshida participated in the conference, acquired the latest information on correctional policies and practices in each participant's country, and extended UNAFEI's professional network among the ICPA participants. The Asian and Pacific Conference of Correctional Administrators (APCCA) is an annual conference of officials responsible for the administration of prisons and other correctional systems in the Asia and Pacific Region. The 31st APCCA conference was organized by the Correction Bureau of the Japanese Ministry of Justice in early October 2011 in Tokyo, Japan. The participants exchanged information and opinions about contemporary issues in their respective countries and regions, international transfer of sentenced persons, partnership with the private sector, recruiting and training of staff, changing offender profiles and so forth. They also shared up-to-date theories, practices, and developments in their respective countries and regions. Many of the delegates were UNAFEI alumni, several of them now promoted to highly influential positions. The conference was another opportunity to renew our friendship and to strengthen the UNAFEI's extensive network of criminal justice professionals in the Asia and Pacific Region. The International Forum on Halfway Houses was held in Beijing, People's Republic of China, with experts from countries including China, Canada, the United States and Singapore. As a part of a community correction system, currently an issue in the treatment of offenders which is the subject of much focus in China now, plans to establish halfway houses are underway. Experts from different countries reported on the system of halfway houses in their respective nations and discussed their characteristic and problems. 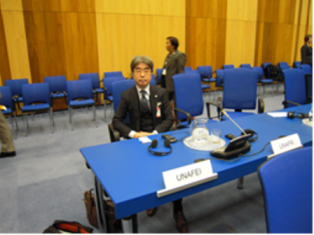 Professor Sakonji from UNAFEI made a presentation on the practice of Offenders Rehabilitation Facilities in Japan (Japanese halfway houses). The Independent Commission Against Corruption (ICAC) Symposium is held almost every other year by ICAC, an anti-corruption enforcement agency in Hong Kong. The symposium invites leading persons from criminal justice institutions and international organizations around the world to be panellists, in order to exchange opinions about the prevention and investigation of various forms of corrupt practices. In December 2009, the European Anti-Fraud Office (OLAF) also joined the symposium as a co-host. Under the main theme of “Corruption and Corporate Governance in the Private Sector, Ethe symposium participants actively exchanged opinions on the latest international trends, relevant issues and countermeasures. 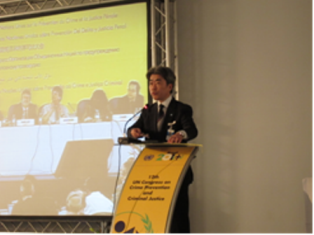 From UNAFEI, Professor Harada took part in the symposium. UNAFEI has invited many visiting experts from ICAC to the International Training Courses on the Criminal Justice Response to Corruption (held every year since 1998), and they have always given informative lectures. In the symposium, Professor Harada exchanged opinions with ICAC practitioners who had lectured at UNAFEI as visiting experts in the past. The Director of the UK Serious Fraud Office (SFO) and the Director of theCorrupt Practices Investigation Bureau (CPIB) of Singapore, who had also been UNAFEI visiting experts, also took part in the symposium as panellists. Through exchanging opinions with those high-ranking officers from countries engaged in advanced countermeasures against corruption, Professor Harada collected useful information about the latest related efforts and strengthened professional relationships between UNAFEI and its human network.